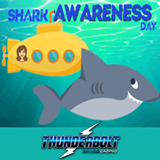 This Thursday is international Shark Awareness Day and in tribute to the incredible predators of the southern oceans, South Africa’s Thunderbolt Casino has published a shark information page to help create greater awareness and appreciation of these often misunderstood creatures. They're also giving free spins on some deep sea-themed slots in a series of Shark Day Casino Bonuses. The purpose of Shark Awareness Day is to help people appreciate how magnificent – and endangered -- sharks are. The worldwide demand for shark-fin soup and indiscriminate commercial fishing practices result in millions of sharks being killed every year – 11,000 every hour of every day. These casino bonuses are available until July 31, 2016 by entering the appropriate coupon code when depositing at the casino. These are staggered bonuses and must be claimed in order. The last one is a no deposit bonus! The free spins are on two popular games from Realtime Gaming. Ocean Oddities is a 5 reel video slot featuring some very strange undersea creatures including a shark that barks (the Wild symbol), a snail riding a seahorse, a king cod, a grumpy lobster, a sinister spiked crustacean, and a flying fish with pilot’s goggles. The Scatter is a Pearl and three or more trigger 16 free spins. Mermaid Queen is an underwater fantasy where players collect treasure and beautiful Mermaids trigger free spins where prizes are doubled or even tripled. Players can bet up to 100 Rands per spin. Thunderbolt offers hundreds more online slots and table games, all played in Rands, and provides excellent customer service in both Afrikaans and English.